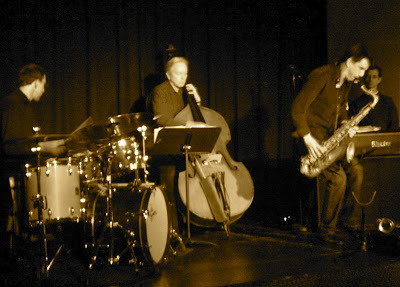 *"These aren’t just some of the best musicians in Kansas City," KCJazzLark writes in a review of a performance by Matt Otto, Jeff Harshbarger and Mike Warren. "These are among the best musicians playing jazz in 2011, anywhere." *Mark Edelman raves about Karrin Allyson's appearance at Jardine's. He also is thankful for Kansas City's jazz scene. *Steve Paul assesses the Kauffman Center's first few months of operation. *Roger Wilder's new site offers a small update. 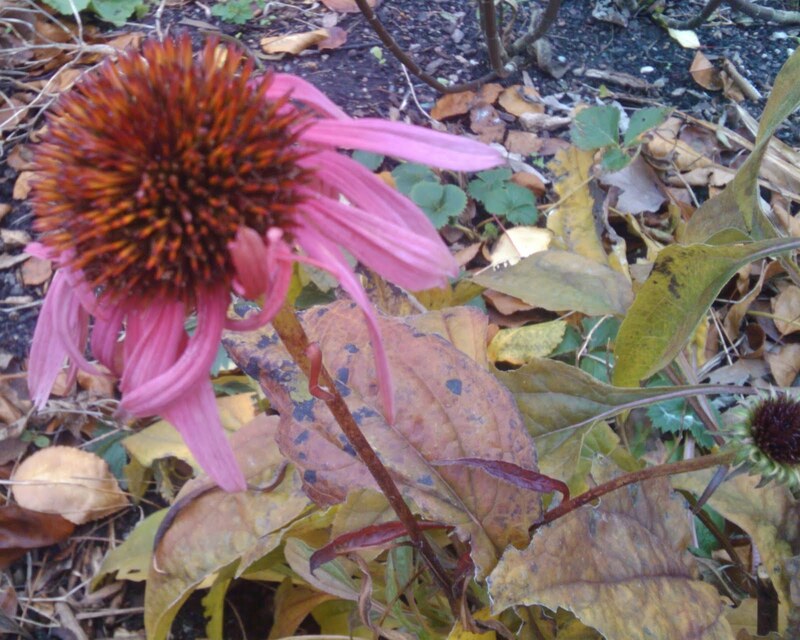 *There's quite a dust-up happening in the comment section of Plastic Sax's November 23 post. See the following related item. *Here's notification of a last-minute schedule change from Take Five Coffee + Bar: Matt Hopper, Ben Leifer and Philip Wakefield will perform at the Leawood venue this Friday, December 2. Plastic Sax rarely features non-original work, but I jumped at the opportunity to present new insights into the career of the legendary Mary Lou Williams from jazz great Buster Williams. Frank R. Hayde conducted the following phone interview with Williams in March. Aside from the links I've added to the transcript, it appears almost precisely as Hayde presented it to me. Frank R. Hayde: Buster Williams, thanks for taking the time to share some of your memories of Mary Lou Williams, who, as you know, is not only one of the towering figures of Kansas City jazz but someone who literally personifies the entire history of jazz, having both played in and influenced each of the major eras of the music. In the early 1970’s, long after she helped pioneer Kansas City swing with the Andy Kirk Orchestra, Mary Lou Williams was making a comeback, working primarily in the piano trio format. Along the way she established a reputation among bass players as a strict taskmaster with extremely high standards. During one yearlong engagement at the Hickory House, she went through 18 bass players and even fired Richard Davis! Then she found Buster Williams and you became her favorite bassist. What was it about your playing that not only satisfied her, but also actually inspired her? Buster Williams: In about 1969 I had just moved back to New York from L.A.. Bob Cranshaw was playing an engagement with Mary Lou at the Knickerbocker and Bob had to go do something else. I was friends with Bob and he turned me on to that gig. From the first night- the first set, we hit it off. Whatever I was doing she liked and our musical relationship went on from there up until the time she passed away, when I played at her funeral. When we played Mary Lou’s Mass at St. Patrick’s Cathedral it was a historic occasion and it got two full pages of pictures and reviews in the New York Times. Mary Lou Williams was a great teacher. That’s the beautiful thing about this music… Anytime you play with a didactic person, and by that I mean someone who is a master at what they do, you learn from them directly and indirectly about music and life. There’s no way to study under a real master in this music and just learn music. To be connected with this person you learn all about life because it’s all interconnected. Later she took a teaching gig at Duke University and from that time on we didn’t tour that much anymore. I was doing a lot of other gigs during that time as well. We did play her inaugural concert at Duke with Roy Haynes on drums. To be on the bandstand with the two of them was heaven-sent. I’m sorry that concert wasn’t recorded. It was fantastic. Frank R. Hayde: Speaking of fantastic, let’s talk about the 1975 recording Free Spirits with Mickey Roker on drums. It’s a magnificent album and the chemistry between the three of you is awe-inspiring. What was going on during that session that produced such a remarkable record? Buster Williams: I’ve been taught that whenever I have an opportunity to have my instrument in my hand, it’s a golden moment and a moment to cherish. Whenever you’re making a record or appearing live your life is in that moment and that moment is what counts more than anything else. All these are cherished moments for me. I don’t mean to sound elusive. Whenever I played with Mary Lou it was a cherished moment because I was always learning. She was never at a loss for interesting things to say. I used to like to watch her when she played because every now and then she would look up at me with such a big smile. It was like a big smile of saying “I’m so happy to be doing this,” and also a smile of acceptance of what I was playing. So whatever happened on that record date was no different than what always happened when I was playing with her… And also Mickey Roker. I love Mickey Roker! He’s one of my dearest friends and from the first moment we ever played together it was an incomparable groove. When I was playing with Benny Golson in Philly, Mickey came in and introduced himself. We struck up friendship right then. The very next day we went to a pool hall and played pool all day then he took me to his home and he and his wife fixed me dinner. And our friendship goes on to this day. Frank R. Hayde: Did Mary Lou ever talk about her years in Kansas City and the scene that she helped develop in KC back in the 20’s and 30’s? Buster Williams: I’m a lover of jazz stories. I can sit at the feet of the masters and listen to stories all day long. Mary was never at a loss for new stories that I had never heard before. The thing you have to remember, though, is Mary used to run a lot of information together. She’d be talking about one thing and all of a sudden she’d be talking about another thing. She talked a lot about her days in Kansas City with the Andy Kirk Orchestra but that would flow right into her talking about the days when her house was the gathering place for people like Bud Powell and Dizzy and Monk. It all flowed together. There was no moment in her life that wasn’t connected to what just happened and what’s going to happen and you can hear that in her music too. Frank R. Hayde: After more than 30 years as one of the most sought after sidemen, you started leading your own bands in the early 90’s. One musician who appears on several Buster Williams recordings is Geri Allen, who played Mary Lou Williams in the Robert Altman film Kansas City. How did you and Geri become acquainted and how has the spirit of Mary Lou Williams affected your collaboration? I first got wind of Geri when she was playing with Wayne Shorter. I was impressed with what I heard. I spoke with Wayne one day and he was talking about Geri’s potential and that she was someone to keep an eye on. Shortly after that I had an opportunity to take a band to Europe. I took Geri and Al Foster and Robin Eubanks. Geri was a little nervous, she was just coming on the scene but she was such a bright talent. Later, Peter O’Brien, who was a priest, and also Mary Lou’s manager, approached Geri about doing the Zodiac Suite, which I had performed many times with Mary Lou. We made the record Zodiac Suite: Revisited and Geri also appears on my record Houdini with Lenny White on drums. She was the most likely candidate to carry on the legacy of Mary Lou. Frank R. Hayde: You have one of the most impressive discographies in all of jazz. The short list of artists you’ve played with includes Sarah Vaughn, Miles Davis, Dexter Gordon, Herbie Hancock, Chet Baker, McCoy Tyner, Art Blakey, Lee Konitz, Freddie Hubbard and James Brown. Aside from what you’ve already mentioned, what was significant about your time with Mary Lou Williams? Buster Williams: Mary Lou Williams told me she really liked the way that I composed. She pointed out the significant differences in the way I composed that made it uniquely me. I hadn’t looked at it that way until she pointed these things out. On the record My Mama Pinned a Rose on Me, Mary recorded one of my songs called "Prism." In order for her to play the song the way she wanted, she had me play the melody on the piano. We sat down at two pianos and I played the melody while she was free to use her two hands to play the other stuff that she wanted to play. On the record, this came to be titled "Prelude to Prism." The things that she pointed out to me about my writing, I really cherish. The fact that she took the time to show me how to enhance what I was doing in the direction I was going and how to enhance the uniqueness she saw in what I was doing- I can’t thank her enough for that. The great fortune that I’ve had in my career is an accumulation of information. When I mentioned that Mary spoke in a way that was indicative of moments being connected together, the past connected to the present connected to the future, I look at things that same way, and Mary Lou was one of the first great artists that I had the immense good fortune to learn from. Of course, many people thought that I was Mary’s son. We heard that a lot. Sometimes she would say, “Yes, Buster's like my son.” We did have that kind of fondness. I miss her. She would really have a lot to say about the scene today and she would really be making a difference in the scene today. Frank R. Hayde: Finally, I heard you were abandoned in KC for a week back in the 60’s. Could you tell us about it? Buster Williams: That was some week! In 1961 I was playing with Gene Ammons and Sony Stitt. George Brown- “Dude” we called him- was the drummer and John Houston was on piano. We were in KC playing a club for two weeks. I don’t remember the name of the club, but it was owned by two brothers who were connected to the Mafia, and one was named Charlie. At the end of the two weeks, Gene Ammons called a meeting on our last night- Saturday night. We were all supposed to be getting paid. The meeting was about the fact that there was no money. Gene had used up all the money supporting his needs. So we agreed that he would go on to Chicago and send us the money for us to come up there and open at our 16-week engagement there on Tuesday. Well, I’m young and dumb and full of high spirits and trusting and of course Gene went on to Chicago, and come Tuesday, when we were supposed to already be there opening up, we still haven’t received any money. We called the club in Chicago that evening and wouldn’t you know it, in the background when someone answered the phone, we heard Gene Ammons playing. We realized we weren’t getting paid. We went to the club owner in KC and explained our plight- that we were stranded. He said, “Well, Al Hibbler is coming with only a piano player, John Malachi. He needs a bass player and drummer so Buster, you and Dude can play with Al Hibbler, and John, you can play intermission piano.” So now we could work and get our money for our transportation back home. Al Hibbler was a real character. He loved to show you how much he could do even though he was blind. One night he and the club owner got drunk together after the gig in the wee hours of the morning and the club owner fell asleep. The next day the club owner wakes up and he’s been robbed! He calls the police and they come and they speak with Al Hibbler. Back then we had two-dollar bills. The night before, Al Hibbler was telling the club owner how he could distinguish between a one-dollar bill and a two-dollar bill and a five and a ten and so on… so he took all the two-dollar bills out of the cash register. It was sort of like a bet. He did this to prove it to him. He took about 80 two-dollar bills! Al tells them what happened and the club owner drops the charges. One night we get off the gig and went to the coffee shop in the hotel, which was on the same block as the club. The place is packed. Somebody comes in off the street, takes out a gun and fires the gun in the air. Pandemonium erupts! There were two doors - one that went to the street and one that went into the hotel lobby. Nobody was going toward the door to the street because the guy with the gun is standing there. So there’s a bottleneck at the door going into the hotel lobby. Chairs are all turned upside-down; people’s feet are caught in chairs… We were trying to get out and also protect Al but Al gets out that door before everyone else! His room is straight down the hall. We finally get through the bottleneck and run down to his room and he’s standing there in the dark out of breath and laughing at us because he got out before we did! Al was a great singer, a great entertainer. He liked to meet the women… He usually took advantage of being blind by just feeling all over, and they would stand there and let him do it because that was how he could see. He really knew how to use it! It was a most entertaining week. 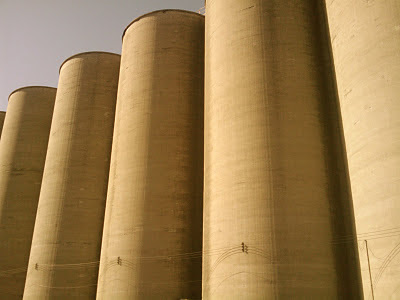 I have fond memories of Kansas City. In those days there were two separate unions, the black union and the white union. I remember going to the black union and hearing some astounding young musicians and sitting in with them. You could see and experience first-hand the legacy of Kansas City being carried on. That same week, Gene Ammons got arrested and spent the next few years in jail. I eventually collected the money he owed me and when he got out of jail he called me and we made the record The Boss is Back. The last time I was in KC I played at the Gem Theater with Jimmy Cobb’s band. I rode along that block and the club and hotel are not there anymore. You’d never know they existed. The preceding interview was conducted Frank R. Hayde, author of The Mafia and the Machine and Italian Gardens: A History of Kansas City Through Its Favorite Restaurant. Apropos of nothing, here's Kansas City native Ben Webster. *Joe Klopus offers an insightful profile of Dave Scott. The trumpeter performs at the Blue Room on Friday. *Culled from Facebook: The December 4 gig at the RecordBar serves an album release party for The People's Liberation Big Band. The collective's new recording is titled The Nutcracker and the Mouse King." *Mark Southerland is a characterized as "a legendary jazz saxophonist from Kansas City" in a preview of a Jacob Fred Jazz Odyssey concert in Oklahoma. *Muncharoo offers a discount to Karrin Allyson's forthcoming shows at Jardine's. *Hunter Long wrote an amusing essay about composition. *Michael Pagan provides a transcription of a piano solo on a track from his Three For the Ages album. *Hermon Mehari provides a stream of a trumpet solo from a gig with KC Sound Collective. *Is Dave Stephens "Kansas City's greatest living jazz man"? That's Tony Botello's take. *In his review of a hip hop concert, a presumptuous fool suggests that Tech N9ne has supplanted Count Basie as the definitive sound of Kansas City in the minds of most contemporary music fans. *If you're not already excited about Roy Ayer's concert in January, maybe this will help. Plastic Sax recently conducted an email interview with Karrin Allyson. The unedited transcript follows. Allyson performs at Jardine's on November 28-29 at 6:30 p.m. and 8:30 p.m. Plastic Sax: What are your memories of living in Kansas City? Are there any KC-based musicians you wish you could play with more often? Karrin Allyson: I don't know where to start with memories of KC! When I first got there (via Minneapolis then) I was 'commuting' from Mpls to KC --to play at my uncle's club (Ron Schoonover) the Phoenix. It became a full time job for me, so I moved and met wonderful players like: Rod Fleeman, Bob Bowman, Danny Embrey, Paul Smith, Todd Strait, Gerald Spaits, Tommy Ruskin, Russ Long, Milt Abel, Mike Metheny, The Scamps, Richard Ross, Julie Turner, Stan Kessler, Doug Auwarter, Kim Park, Carol Comer, Joe Cartwright, David Basse and many more-- Also this is where I met Bill McGlaughlin who was then the KC Symphony conductor. These are also all musicians I'd love to work with again. PS: You've had a long working relationship with guitarist Rod Fleeman. What does he mean to you? KA: Rod makes EVERYBODY sound better! He is a true poet on that guitar and musically, is game for just about anything. He's un-failingly supportive and sweet. PS: There's a catch in your voice, a sort of scratchy texture that adds to the emotional resonance of your singing. Is that something you deliberately control or does it just happen? KA: I'm afraid that just happens. PS: The composer and drummer Matt Wilson recently spent some time in your band. How did that come about? Can you name a few additional prominent musicians with whom you'd like to work? KA: I've known about Matt for quite awhile and always admired his original approach. He's featured on the latest CD 'Round Midnight although, it certainly wouldn't be considered a 'drum feature' project. He helps me tell the 'story' as do all the players I choose. I've worked with wonderful drummers; Todd Strait, Lewis Nash, Joe LaBarbera, Mark Walker, Eric Montzka, and Matt- but I find that is the hardest 'chair' to fill in my band-- our repertoire is VERY varied, so he/she must come with many styles under his/her belt and let the music breathe. PS: I enjoyed seeing the photos you posted to Facebook from your recent European tour. Did you have as much fun as it seemed? Is Europe your strongest market? KA: At times, being on the road is just as fun as 'it looks' :) but at other times, it is not-- it can be very tiring. But usually the people and the music lift you up. I would not say Europe is my strongest market-- but we're working on it! I love going there. PS: As an obsessive music nerd, I'm often infuriated when inconsiderate chatter interferes with my appreciation of a live performance. Even so, your insistence on a strict no-talking policy at your shows has raised eyebrows. Why did you decide to take a severe stance? KA: This is not something I 'chose' to do -- whenever I'm in the audience, I feel drawn to the music and that is why I came. It's important to not only show respect for the artists, but also your fellow audience members. There are plenty of other places folks can go to talk and hang out and I am one of them often! But it's so much better when in live performances, the listeners and the players are connected in the music. PS: The version of "April Come She Will" on your new 'Round Midnight album contains elements of folk, cabaret, pop and jazz. It's difficult to discern where one form ends and another begins. Do you concern yourself with distinctions of this nature? PS: I was initially dismayed to discover that 'Round Midnight includes "Send In the Clowns." Most renditions of the song are simply awful. Yours is an exception. What's your favorite version? And speaking of torch/saloon songs, who are your favorite artists in that realm? KA: "Send in the Clowns" is a song I've been doing for years, on & off as I've been in many different 'musical worlds' throughout my career. We experimented with several ways of doing this, and Rod came up with beautiful chord changes and we decided on a very slow 'bossa' feel to help let it breathe. I don't really think of my favorite singers as being 'torch' or 'jazz' or 'pop' etc but of course we all have our approaches. Each tune has its own as well! PS: It's my theory that jazz is experiencing an artistic renaissance even as the audience for jazz continues to contract. Do you agree? KA: I honestly never know how to answer this question. I do know that jazz is STILL alive and well and the business of it always changes.... I feel very lucky to make a living at what I love to do. PS: Beena told me that you'll be performing with Rod Fleeman, Gerald Spaits and Randy Weinstein at Jardine's. What's up with the harmonica? KA: Hmnmn, what's up with the harmonica? Ask Toots Thielemans! The harmonica for me can be kind of a 'chameleon' in that, it sounds great on the blues (of course) and also be-bop (in the hands of a good player like Randy who plays CHROMATIC harmonica) standards, and also that 'exotic' sound we like to add with brazilian and french music. Randy is from KC, and has played on several of our earlier KC recordings.... I've always loved his style and he's very loose and game for anything. I have a love-hate relationship with organ trios. The format can seem hopelessly hackneyed. In the right setting, however, nothing's better. Guitarist Bobby Broom of the Deep Blue Organ Trio broaches the subject in an interview that serves as a preview of his band's show Saturday at the Blue Room. The Chicago-based act is touring in support of its new tribute album to Stevie Wonder. *Jenee Osterheldt reports that Myra Taylor is in poor health. *Angela Hagenbach is interviewed by the Leavenworth Times in advance of her concert Saturday at the Hollywood Theater. *"While Memphis bemoans the Folk Alliance International's announced move to Kansas City, St. Louis appears to be gaining ground on another music-related front: creating a blues museum to celebrate the Delta-born art form and pull in visitors," suggests the author of a story about St. Louis' National Blues Museum. *Intentions, the restaurant and nightclub in Overland Park that sporadically served as a venue for live jazz, has been shuttered. 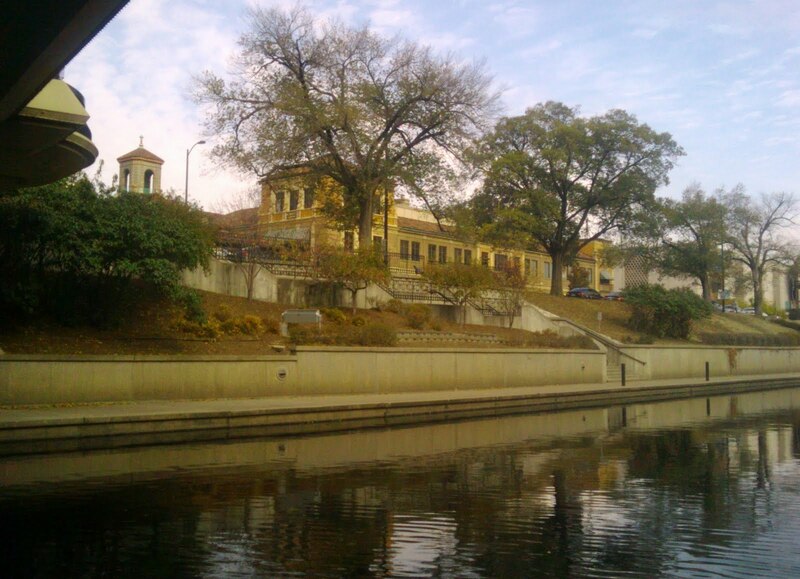 *KCJazzLark elaborates on a previous post concerning the proper location for jazz festivals in the Kansas City area. *Roger Wilder now has a proper web presence. *The American Jazz Museum is involved in a Kickstarter campaign for a documentary about Cecil Taylor. *Chuck Berg applauds a Topeka Jazz Workshop concert featuring Ken Peplowski and John Fedchock. *A Hutchinson, Kansas, newspaper previews a Marilyn Maye concert. *Pat Metheny has a Vimeo channel. *Lucas Homer provides notes on the next couple weeks in live jazz. *From Peter Lawless: The Ad Hoc Music Series Presents: Game Night (Sunday, Nov. 27 at 8 p.m.) This special event will feature series curator Peter Lawless and his closest musical friends performing a number of original “game pieces.” These playful pieces combine performance art, spoken word and musical improvisation; promising fun, excitement and uncertainty as each note is determined by the roll of the dice and the luck of the draw. Among the games to be played are the meditative Curling, an exciting Board Game for Improvisors, and the return of the infamous PBR Performance Art Olympics. *From Kemet D. Coleman: I work for MAC Property Management. We are having a Jazz Night in the lobby of our Clyde Manor building (350 East Armour Blvd.) next Tuesday, November 22nd from 7-9PM. The band will be lead by Hermon Mehari and we will be giving away a free Kindle Fire! Chances of winning are pretty high. Free food and booze will be available. The Art Ensemble of Chicago were one of the gateway acts that allowed me to fully embrace jazz. I didn't feel as if I was sacrificing any of the entertaining elements of popular music when I listened to the loopy, noisy and fun band. The similarly named Westport Art Ensemble, while progressive by Kansas City's standards, was far less outrageous than its brethren from the Windy City. I smiled when WAE opened its set with atmospheric AEC-style clattering. In spite of the noisy introduction, WAE sometimes seemed like a mainstream jazz act. Each of its members is respected by swing-obsessed jazz fans. Upon closer inspection, however, WEA frequently features subversive elements that are anathema to traditionalists. Drummer Todd Strait, a big favorite among swing fans, didn't hesitate to pound aggressively. 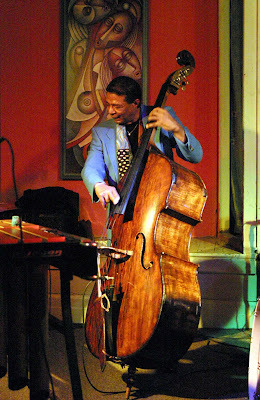 Bassist Gerald Spaits, a near-legendary mainstay of the Kansas City scene, displayed remarkably imaginative melodic concepts and a startlingly innovative technique. The Rhodes piano work of Roger Wilder evoked '70s-era Chick Corea and Herbie Hancock. Josh Sclar played the role of a straight man in the tradition of hard-charging saxophonists like Eddie "Lockjaw" Davis. Seeing the guys together again was a treat. I hated to break away from the audience of about 100 after only 45 minutes, but I had to prepare to enter the jungle. Plastic Sax may not be particularly important, but a handful of important people monitor this jazz blog. I'd like to bring a significant milestone to their attention. January 4, 2012, will be the 90th birthday of Frank Wess. The Kansas City native and veteran of Count Basie Orchestra is still gigging and recording. He's also makes for a good interview. I'm putting you on notice, media and museum VIPs- you have almost eight weeks to find a way to acknowledge the man and his achievements. *A reporter for KCUR marvels that "fake storefronts, including movie facades" from Robert Altman's 1996 film Kansas City "(h)ave been in place longer than many businesses" in the jazz district. The station also reports that a tax-increment financing plan for the jazz district has been terminated. *Take Five Coffee + Bar and 1911 Restaurant & Lounge are praised by KCJazzLark. *1911 Restaurant & Lounge finally has a web presence. The Pitch examines the venue's bathroom facilities. *Hermon Mehari is the subject of an Ink magazine cover story. He's also featured in a promotional video for the Kansas City Chiefs. *Michael Pagan makes a pitch for the American Jazz Museum. *A Star staffer promotes 1911 Main and KC Youth Jazz. *Joe Klopus previews a Westport Art Ensemble reunion show. *Joe Athon pleads for inter-agency cooperation in Kansas City's jazz district. Here's fresh footage of Athon performing at Jardine's last month. *Project H has initiated a Kickstarter campaign. *Pat Metheny's 1999 duet album with Jim Hall was reissued this week. *Matt Penman of the SF Jazz Collective participates in a video interview to promote the band's appearance at the Lied Center. *Kristin Shafel reviewed Herbie Hancock's concert at Lied Center. *The Pitch catches up with Victor & Penny. *Another musician who once played with Charlie Parker has died. *Here's footage of a young Polish group covering Bobby Watson's "Wheel Within a Wheel" in Austria. 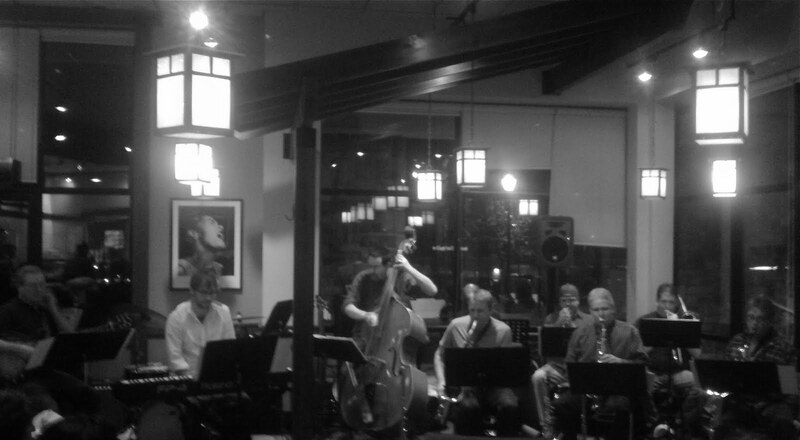 *Tweet o' the Week: LesIzmoreHOD: Big Band Jazz at Harlings till 12. No cover. Midtown sh_t. *From Jim Mair: Great jazz will fill the Performing Art Center at Kansas City Kansas Community College Monday through Thursday, Nov. 14-17. Three Big Bands will kick off a series of four concerts in four days on Monday night. All four concerts are scheduled to start at 7 p.m. and are free to the public although donations will be accepted. The schedule: MONDAY – Three big bands, the KCKCC Jazz Ensemble directed by Jim Mair; the Turner High School Jazz Ensemble directed by Mike Altenbernd; and the Ottawa University Jazz Ensemble directed by Todd Wilkinson. TUESDAY – KCKCC Jazz Combos directed by Mair and Latin Band directed by Jurge Welge. WEDNESDAY – Kansas City High School All-Star Jazz Ensemble directed by Hermon Mehari and Diverse. THURSDAY – KCKCC Vocal Jazz directed by John Stafford. Opportunities to hear live renditions of compositions by Sam Rivers and Larry Young are rare. Hearing them in a coffee shop about 25 miles southwest of Kansas City's historic jazz district is even more unlikely. Yet that's just what transpired Friday at Take Five Coffee + Bar in south Leawood. A quartet led by saxophonist Rich Wheeler startled a capacity audience of three dozen at Take Five, an increasingly vital venue on the regional jazz scene. Respectful of tradition yet intent on exploring the outer fringes of jazz, Wheeler's quartet exhibits a sensibility similar to the recent work of influential British veteran Dave Holland. Wheeler, perhaps best known for his associations with Alaturka and People's Liberation Big Band, plays with more warmth and with bluesier tones than most experimental saxophonists. Keyboardist T.J. Martley takes surprising tangents as he solos. In addition to playing solid bass, Bill McKemy contributed the excellent original piece "Homeland Security." Instead of Tony Williams and Elvin Jones (the original drummers on the Rivers and Young recordings), drummer Sam Wisman's playing evoked Jack DeJohnettte. Take Five may be situated in a soul-sapping commercial development far from the center of the city, but between Wheeler's band and the delicious array of beverages served by its friendly staff, the venue was surely one of the hippest places in the region for a couple hours last Friday evening. "Sissies" is something you don't hear every day in the notoriously homophobic realm of jazz. Los Angeles-based Mark Winkler , the song's lyricist, performs at Jardine's this weekend. According to the club's calendar, Winkler plays Friday at 6 p.m. and Saturday at 6 p.m. and 8 p.m.
*KCJazzLark addresses the ways in which Kansas City's racial divisions impact its jazz scene. 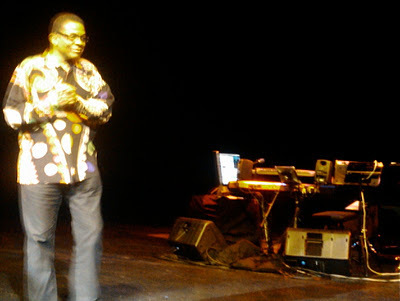 *Herbie Hancock's performance at the Lied Center receives vastly different reviews from The Pitch, The Star and Lucas Homer. *A critic for an Irish newspaper reports that Bobby Watson combined "flawless virtuosity with emotional intensity" in a recent headlining appearance at a festival in Cork. *A Pat Metheny concert in Bulgaria is reviewed by a rapturous fan. *Jazz Times takes note of Marilyn Maye. *Jazz advocate Merrilee Trost, who spent her formative years in Kansas City, is being celebrated in California. *Tweet o' the Week: marklowreymusic: Come check out this new jazz club where Bar Natasha used to be. 1911 Main tonight! Mark Lowrey With Drums 8-11pm. the press release. A little additional information: We'll be playing the first half of the concert (the Wind Ensemble is the second half). The Gershwin suite that we will be performing was written by John Williams for Shelly Manne's big band in 1965—it's a great piece! Gary Foster (saxophone), Steve Houghton (drums) and Clint Ashlock (trumpet) will be guest soloists with the band. We'll open the concert with Bob Brookmeyer's "Silver Lining", a composition from his great 2006 recording "Spirit Music". *From a press release: The University of Kansas Jazz Ensemble I will perform Wednesday, November 9, 2011, at 7:30 p.m. at the Lawrence Arts Center, welcoming special guest artist, Bug…. The first half of the concert will feature Bug performing with the KU Jazz Ensemble I, playing works by James Miley. Bug will then perform the second half of the concert. The concert is free and open to the public. *Plastic Sax P.S.A. : The jazz programs affiliated with Kansas City Kansas Community College perform tonight, Wednesday, November 2, at Jardine's. 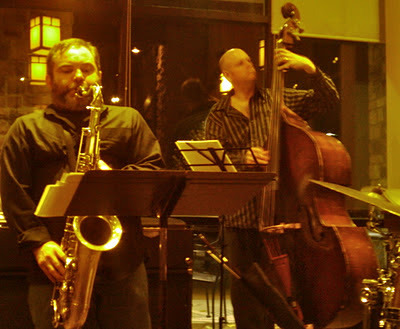 *November's listings have been added to The Kansas City Jazz Calendar.